On Saturday, November 5, 2016, 170 Brother Knights learned the lesson of Patriotism and received the honor of becoming 4th Degree members of our Order at the Koger Center in Richmond, Virginia. 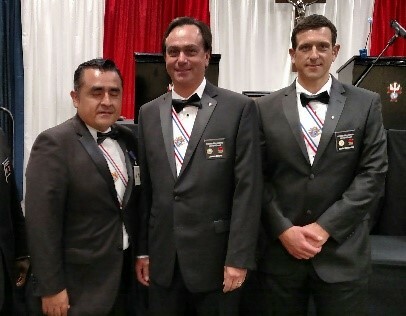 Supported in Richmond by Worthy Grand Knight Cesar Anchiraico and Deputy Grand Knight Roger Williams, Council 4522 welcomes our own two new 4th Degree Knights into our ranks, Sir Knights James (Jay) Moore and our Faithful Newsletter Editor-in-Chief, Daniel Zaharevich. We are very proud of all our Knights, and especially for those who step up to the 4th Degree! Congrats to Sir Knights Jay and Daniel!